Small dogs sometimes get the rap that they’re just cute and cuddly and are not useful in protecting anyone. Well, that’s definitely not true. 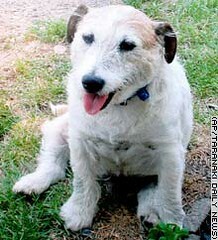 Meet George, a 9-year-old Jack Russell Terrier from New Zealand. He gave his life to save five children from two pit bills. George tried to protect the children by barking and jumping on the pit bulls (even though he’s less than a foot high), but the pit bulls started to bite George while the children were able to escape. Eventually, people saw what was happening and ran to help George, but he was so badly mauled that George had to be put down. George, you truly are a huge hero. This entry was posted on Wednesday, May 2nd, 2007 at 4:40 pm	and is filed under Dogs, National Dog, Cat & Pet Info, News for Cats, Dogs & Owners. You can follow any responses to this entry through the RSS 2.0 feed. Both comments and pings are currently closed. I have a little JRT and they definitly have a huge heart and are brave beyond their size. My heart goes out to that family, I imagine those boys will never forget that. I don’t think that people necessarily raise pit bulls to be killer dogs. I think that a pack mentality takes over and when you get two dogs working together they can really do a lot of damage. I’ve seen this happen right in front of me but it was the reverse, one doberman and a cattle dog attacking a pit bull. The cattle dog went for the neck, and the other one went for the tendons on the back legs. It was a terrible sight to behold and the pit bull was at a real disadvantage. The pit was my dog. I kept yelling and finally I got the other dogs to stop by slammping a trash can lid against the nose of the cattle dog and screaming my lungs out. My dog had 30 bite marks in her head and some deep ones on her neck and she got in only one bite on the cattle dogs front paw. I don’t believe that many people are familiar with the dynamics of attacking dogs and dogs that pair up on a street, supposedly protecting a wider and wider territory. Two dogs that know each other and work together can just create a lot of damage and then they get their primal instinct going in the rush of it all and the end is just terrible. I feel sorry for the little dog that lost its life. I’m very sad about poor, brave George. I hope his owner is very proud of him and manages to take some comfort in the knowledge that George helped distract the bigger dogs from the kids. As a dog parent that just lost a dog and is struggling with keeping 2 more alive, I didn’t appreciate this story! I cried my heart out that another dog (George) had to die, now to pit bulls. I feel for his heroism . . . but losing him over such a senseless mauling made my own pain pierce through my heart that much more again. Can’t we have some happier stories . . . PLEASE! I read that the owner knew of a problem before with the pits. I personally had to fight off a dog attack, a chow, and my neighbor did nothing to secure his yard, lock the gate, to keep his dog in. The owner of these pits is guilty of gross negligence by knowing that his dogs had a propensity to do harm. This was a good story to see because it goes to show how much our dogs love us and how valuable they are all of them. I am so sad the dog died …..and sorry for the lady above who lost her dog….they do have a lot of cute and happy stories farther down on the site…maybe read those. It is sad of losing the cute little dog but it is happy of saving the five children. The 5 children learn the good and evil among people and pets. They gain from this real life story and might grow up to save numerous dogs. This real life story enrich people and pets in love and maturity. It IS a very sad story. But having known my share of JRTs, somehow I think George would have done what he did regardless of the outcome. He saved his kids. What other choice would a terrier make? The fact that the dog was mauled to death is horrible all on its own. End of story. I personally lost a kitten when I was a kid to a former neighbor’s pit bulls. I’d know. Speaking as somebody extremely bonded with my cats, I never saw it as being more of a tragedy just because I (the owner) was a child. It was an unspeakable, horrifying tragedy all on its own, and nothing can mitigate that, any more than if it had been my little brother. It’s a huge problem in many areas that people *do* deliberately raise them (often abusively) to be aggressive and territorial, as a macho-looking guard animal or for illegal dog fighting. These dogs were in that category; the neighbor had to introduce the nearby kids carefully as “friends” because if the dogs got loose while we were in front playing, they might otherwise think we were on their territory and kill us. Don’t get me wrong… I know of at least three victims of unprovoked dog attack, two of which were severely injured (face taken off) — none were from a pitbull. Any breed can be dangerous: I’m not saying this is exclusively a pitbull issue. *But* pits do have stronger jaws that allow them to do incredible damage, and a huge number are trained specifically to attack. If a person has any reason to believe that their dog will attack people or other animals unprovoked, then that dog belongs somewhere safer for both sides. I’ll think of hansome Geroge and his bravery and love and be inspired by it till I die… tears for George and hope his family knows how he is loved by people who who never met him. George was a brave little guy. . . and yes, some people do raise dogs to be means (dogs of any breed — pits are just the ones the media picks up on the most). Its unfortunate as I know some wonderful pittie. . . in fact, they are called “Nanny Dogs” as many are so good with kids. Its sad what people can do to animals. Good on you, George. You are a hero. Interesting that I have heard and read of dog attacks on other dogs and innocent bystanders but never on criminals. What’s up with that?